A good replacement for the discontinued original Raynor 15-tooth sprocket that was used as a front idler sprocket on the Flitestar & R-Series garage door operator models. *NOTE: When used as a front idler sprocket for the above listed Raynor operators you'll need to use the included insert & washer. 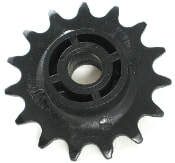 This sprocket has the same number of teeth & is the same width as the original Raynor sprocket. The only difference is the bolt hole is larger and it's slightly shorter in height. With the included insert the bolt hole will match the original bolt used to mount the sprocket and the washer will give it the proper height. The insert & washer are not needed if the sprocket is being used a rear idler sprocket on an Allister or Allstar operator.